Frederika Louisa of Hesse-Darmstadt (Friederike Luise; 16 October 1751 – 25 February 1805) was Queen consort of Prussia as the second wife of King Frederick William II. Frederika Louisa was the daughter of Louis IX, Landgrave of Hesse-Darmstadt, and Caroline of Zweibrücken. She was born in Prenzlau. She was the sister of Grand Duchess Louise of Saxe-Weimar-Eisenach, as well as Grand Duke Louis I of Hesse. She and Frederick William were married on 14 July 1769 at the Charlottenburg Palace, immediately after his divorce from Elisabeth Christine of Brunswick-Lüneburg. Frederick William called her his "Hessische Lieschen", or "Hessian Lizzie". She became queen of Prussia upon her husband's accession to the throne in 1786, and kept her position for eleven years. The marriage was not happy, and Fredrick had numerous lovers, most notably Wilhelmine von Lichtenau, with whom he had a relationship from the same year he married Frederika Louise until his death. 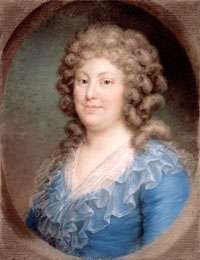 In 1787, her spouse committed bigamy by marrying her lady-in-waiting Julie von Voß, and in 1790, he committed bigamy again by marrying her lady-in-waiting Sophie von Dönhoff. Frederika Louisa was noted for her great generosity, especially to those in need. From 1788, she spent her summers in Bad Freienwalde, where she was often visited by her children and grandchildren. This greatly contributed to the economic and cultural development of the city. Especially as a Queen Dowager, several buildings were constructed in the city to house her and her court during their stays. In 1799, a summer palace was built for her there by David Gilly. She became a widow in 1797. Frederika Louisa has been described as eccentric, especially during her widowhood. It was claimed that she saw ghosts and apparitions, and for this reason she kept reversed hours, sleeping by day and waking by night. The Queen Dowager had invited us at déjeuner, and we left for Montbijou, a very simple manor slightly outside of Berlin, where she resides all year. It is sweet and well tendered but terribly small. She had it built herself, as well as the park and the garden. She is a small, very fat, middle aged lady, who walks so crocked that she looks like and old woman. You could mistake her for one of these fairies from an ancient tale. She is very polite and talkative and shines of a goodness which gives the witness of a kind heart and a noble character. She died in Berlin in 1805 having suffered a stroke. HM Frederick William III of Prussia (1770–1840); married Louise of Mecklenburg-Strelitz and had issue. HRH Prince Louis Charles of Prussia (1773–1796); married Frederica of Mecklenburg-Strelitz and had issue. HRH Princess Wilhelmina of Prussia (1774–1837); married William I of the Netherlands and had issue. HRH Princess Augusta of Prussia (1780–1841); married William II, Elector of Hesse. HRH Prince Wilhelm of Prussia (1783–1851); married Landgravine Marie Anna of Hesse-Homburg and had issue. 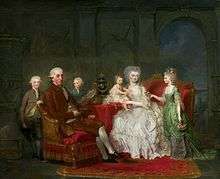 The generations indicate marriage to Frederick I, the first King of Prussia, and his descendents.